Water, Cetearyl Alcohol, Glyceryl Stearate,Polysorbate-60, Stearyl Alcohol, Sunflower Oil, Allantoin, Propylene Glycol, Isopropyl Palmitate, Petrolatum, Diazolidinyl Urea, Methylparaben, Propylparaben, BHT, Carbomer, Benzophenone-4, Stearic Acid. COMMENTS: This lotion base is by far the best base I've found! Not greasy....works well with all fragrances and colors! COMMENTS: This is truly a good basic lotion. It's priced so that you can give your customer a very good lotion at a lower cost to them. Accepts fragrance very well. It goes on smoothly without giving you that heavy, greasy feeling that some other lotions do. Absorbs into skin quickly. COMMENTS: I made a few batches and none of them were moisturizing. They did dry on the hands quickly but neither myself or my testers liked it. It's too bad that I purchased the one gallon. "Very nice for the price "
COMMENTS: I used this for a wholesale order and typically only use goats milk. Love the quality held color and scent well. Only complaint was the bottle it came in. COMMENTS: This is my go to base for my light lotion! It is pumpable and thin enough for squeeze tubes. But, not watery at all! Super moisturizing and silky! I love it! COMMENTS: I absolutely love everything about this base! It holds scents or colorant well and it glides on the skin and soaks in quickly. It is the only lotion we use and all of my customers love it! COMMENTS: Although I used this lotion base in a floral scented recipe, I found that the unscented base housed in the plastic jug had an odor that smelled like the plastic itself. I love all of the products from your company and understand that sometimes we don't always know how it will keep in challenging elements such as hot weather, sitting in the UPS / FEDex center, and so on. It is rich and creamy and does blend well with my geranium essential oil based synergy. COMMENTS: First time mixing my own lotion, decided to try this base and so far it’s been great! Holds fragrances well, easy to work with! Can’t wait to mix matching fragrances to my soap! COMMENTS: worked great in my lotions and feels great on skin. "Use for my sons line of lotions"
COMMENTS: I will continue to buy this lotion it takes all of my scents well and people love it! COMMENTS: This is so simple and easy to work with! Just add fragrance and color and it's done. I love this base! "Very nice feel, easily absorbed "
COMMENTS: I purchased the 1 gallon jug of this base and I am SO HAPPY I did! The base is very light and glides on easily. No greasy feel and holds fragrance and color very well. Thank you so much! COMMENTS: I love this lotion for its simplicity, it allows me to take different ingredients and create specific need products. "BEST EVER BASIC LOTION OUT THERE." COMMENTS: WSP ROCKS IT AGAIN WITH THIS BASIC LOTION, QUAILTY, AND I CAN CUSTOMIZE IT HOWEVER I LIKE,WORDERFUL PRODUCT, SIKIN SOFTEN, WORDERFUL GLIDE ON SKIN, PEOPLE LOVE THIS BASE. YOU ALWAYS HIT IT OUT OF THE PARK. COMMENTS: Awesome base. Goes on creamy. No greasy feeling. Absorbs nicely. Leaves the skin feeling nourished and refreshed. Will definitely buy again. COMMENTS: Lotion Base is smooth, non-greasy, not too thick but not thin either. It is the perfect consistency. It is very easy to mix other oils and fragrances in to customize lotion. Definitely using this product! COMMENTS: I tried this product on a whim. Sells well, however, I've had a couple complaints that customers thought it was a little bit too greasy. COMMENTS: I have extremely dry hands. I was not happy with the texture and feel of the lotion on my hands. I added some coconut oil and more importantly, shea butter to the mixture. I ended up with the perfect recipe for my very dry hands. I am going to share the new mixture with my customers, as samples. Hopefully I will get good reviews from them. COMMENTS: I recently had a customer order for lotion & soap gift sets. I originally used a different lotion base that was extremely hard to get into my 1 oz. bottles. I checked in with WSP customer service to find out if there was a "thinner" lotion base I could use for this project and they directed towards the Basic Lotion Base which has made it so much easier to fill the bottles (1 oz Natural Boston Round Plastic Bottle 20/410). Thank you for the wonderful products and customer service! COMMENTS: Very moisturizing and makes your skin feel soft. COMMENTS: This product is a staple for us. It's definitely an everyday lotion. COMMENTS: Such a nice glide, no 0ily residue. My husband was the first "customer review", a hard sell on hand lotion, but was impressed! I already have 3 shop locations ordering, so this will be a great product to keep in stock. COMMENTS: This is a great lotion base that leaves no sticky residue, and the price is right! It's so easy to blend with essential oils and fragrance oils. Will definitely buy again! COMMENTS: I wasn't sure how I would like the Basic base or if it would be watery. It isn't! It feels wonderful on my skin. I recently make some in Black Raspberry Vanilla scent and it is incredible. Will be getting more of this! COMMENTS: This is the easiest body lotion to customize, ever! I make soaps, and make the same scent in the matching lotion and this is SO easy with the gallon bottle and pump! I just love this! COMMENTS: This is a very nice light lotion, mix your fragrance blends and you're good to go. COMMENTS: very nice lotion, smooth, holds scents great! COMMENTS: The lotion base is perfect for tweaking and making your own. It takes all of the hassle of creating it yourself. It leaves your skin feeling smooth, soft without all of the greasy look or feeling. It hold fragrance and color really well. COMMENTS: this lotion base is silky and does what I need, it does absorb rather quickly I believe due to alcohol. it is not like the homemade scratch ones that linger which is preferred. COMMENTS: I love this lotion base. I continue to reorder because my customers love it as well. Absorbs quickly and leaves skin soft. COMMENTS: This is a versatile base that works up well. Very gentle and moisturizing. COMMENTS: Has an amazing feel to it. Easy to incorporate with other ingredients. COMMENTS: This base is average. I prefer the head to toe but this will do also. COMMENTS: I like this basic base, but I definitely prefer the Goat Milk lotion base more. "Good lotion for a reasonable price"
COMMENTS: My customers love this lotion, it carriers the fo' s very well and keeps the skin moisturized. COMMENTS: This base is always a winner!! The men love it because it rubs right in with no greasy feeling, and the women love how soft their skin is and how well it takes fragrance. It is my top seller, I'm sure It will be yours too! COMMENTS: Goes on smooth, holds scent well. Not greasy feeling. Will buy this again. COMMENTS: I love this lotion base. Its very easy to add scent and color. I sell tons of this! COMMENTS: I wasn't sure how well this base would work, but my customers love it! Carrier oils such as coconut oil and olive oil mix well with the base, as do fragrances and essential oils. For someone with a sensitive sense of smell, this does have a slight odor to it, but it's very faint and doesn't interfere with other scents once mixed together. Very easy to warm up, very easy to blend, and a little bit goes a long way on the skin! Customers have raved about the soft and silky feel of the lotion and their skin when using it. Absorbs fairly quickly and hydrates for hours! COMMENTS: This is really not bad however, It did have a grease like feel right after applying but then it went away. I did like it, not my favorite, but if I have to, I will buy it again. COMMENTS: Very good basic lotion product. My customers really like the fact that it leaves their skin feeling so soft. COMMENTS: Love this! Unscented, easy to add any scent of choice. Leaves skin so smooth and hydrated. Dries fast, not oily. Highly recommend! COMMENTS: This base is so creamy and perfect. I am in love with how smooth this base is and how well fragrances mix with this to make my own unique creations. I will purchase again. COMMENTS: Love this base. Very easy to add fragrance to and glides very well. COMMENTS: I have tried quite a few lotion bases here on WSP but this is probably my favorite go to lotion base. Definitely recommend! COMMENTS: This lotion base is great as a stand alone product or added to my recipes. The lotion has no odor and is very light and easily absorbed. We use the base with skin safe fragrances and a little color and it is ready to go in our containers. Our customers love it. We package it in various sizes including a small purse size container. We have a hard time keeping this in stock. Hightly recommend this base. • It is perfect for our use. COMMENTS: Better than anything I have tried. Before making lotions I was a BandBW lover. But now I make and sell my own lotions. I get a ton of compliments! • The feel and consistency. • Scent mixed in well. COMMENTS: I use this base for my lotions I make for my sons 4 and a half star restaurant. He loves this product, and his customers love it, I now have his customers as my customers with this lotion base. It incorporates additive well! COMMENTS: great quality at a great price!! COMMENTS: Bought this product to use as a lotion base and it is great. I add my essential oils to the lotion and its not greasy and your skin is softer. COMMENTS: Feels so good on skin. Love Love Love it!! But it's very thick unless you add lots of essential oils to thin it out, its very hard to get into a small mouthed bottle. • Thick, hard to pour into another bottle. COMMENTS: This is a great lotion base for beginners. Mixes well with colors and fragrances. COMMENTS: This is a very smooth feeling lotion! It does not have a residue that other lotions leave behind! COMMENTS: This is a great lotion base. COMMENTS: This lotion base is a nice smooth texture. I like to add butters and maybe a carrier oil. It really whips up nice. I use it as a fast and easy way to make a lotion without a lot of effort. I really like this base Lotion. It goes on light with a fresh feeling. COMMENTS: When it came to a "Basic" Lotion for my product line, I wanted something that EVERYONE could use. This Basic Lotion Base is the PERFECT product. FOs & EOs are well accepted by the base and do not separate requiring the customer to "Shake Product" prior to using. Upon use of the lotion, the feeling of sheerness is predominant making you thankful that you've chosen a product that isn't too sticky,too thick or too greasy. I have several customers that have skin conditions that with the arid Colorado Climate, this lotion has given them daily relief. I can't keep this stuff in my inventory even if I tried!!! COMMENTS: I gave this lotion a try after trying the goat milk and honey lotion base. My customers really like the feel and it isn't greasy at all. It has been a good seller and I really like the price. COMMENTS: I've had no problems with this lotion base. It takes scents and colors well. COMMENTS: All I had to do was add fragrance and package! So far I've received all great feedback! COMMENTS: I sold out of every lotion that I put on the shelf!!!! I would definitely recommend this base for beginners like myself. It is a great starter base a little thin but I'm sure that is why they call it basic. I would like to try other bases for a little thicker consistency. But all in all I am very happy with the result and the sales. COMMENTS: I use this personally. I don't like a super greasy lotion after the shower, and this is a great consistency. The only issue I had was in the winter months when my skin was more dry, I couldn't use this lotion. I had to switch to a more moisturizing type. Great for summer though! COMMENTS: This is a good basic lotion, easy to use, easily colors, and you can also add fragrance. The lotion also works in a pump container- which I like. The down side is that the lotion is not super nourishing to skin, I would buy a higher grade next time. COMMENTS: This is the first time I ventured into a lotion body product. Of course, anything I sell I try on myself first. This is a really fine product. My skin felt fantastic after the first use and the moisture level was retained. I like it because it doesn't sit on the skin but is absorbed very quickly. Non-sticky and takes very little essential oils to fragrance a batch - so takes up and disperses fragrance well. "I think this is my NEW FAVORITE!!!" • Price is great for a great product! "first time lotion making experience "
COMMENTS: I am a new to crafting beauty products and this was my first time making hand and body lotion. The lotion base handled very nicely and made it easy for me to make this lotion. My family and friends loved the product. I was very pleased at how easy it was to use this product and made my first time a very pleasing experience with lotion making. I would tell anyone wanting to use a lotion base that this the one to choose for a very nice product. "Basic Lotion Base is a MUST HAVE for any DIY'er!" COMMENTS: Creamy, smooth and absorbs well. No greasy or "heavy feeling" or residue! I LOVE being able to make my OWN scents or use it as part of a kit! (That is how I originally came to know this FABULOUS product!). Very flexible and versatile product! Quite pleased!! COMMENTS: It is a very versitle lotion base. It's a little thin though so if you want to make a body cream this would not be for you. "Crafters Choice™ Basic Lotion Base"
COMMENTS: This is a nice all purpose lotion. I really love the silky lotion more, but that's just my preference. My other peeps like this one because it lighter to use in the summertime. COMMENTS: This is the best lotion base I've ever used. It leaves your skin silky smooth and not greasy. I used the lotion in my Christmas gift baskets this year and so far it has been a BIG hit. Would totally recommend this product can't wait to make another batch. COMMENTS: My costumers like that this base is not greasy feeling. It holds scent well and does not feel too heavy. COMMENTS: we like this product for the fact that it uses sunflower oil as one of the moisturizers. It is not a common ingredient. We normally order it in the gallon jugs which make it easy to handle. COMMENTS: This basic base feels richer than the basic base I've bought from other vendors. For the price, it's a great starting point, or can stand alone. 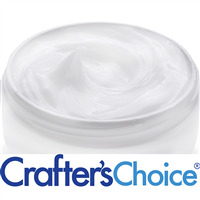 "Crafters Choice™ Basic Lotion Base "
COMMENTS: Nice consistency and holds scents very well. My customers love it and keep coming back for more. I add a little Argan Oil and it makes it feel even richer. Good absorption as well. I will certainly continue to purchase the product! COMMENTS: This lotion was so easy to work with, I can incorporate color and scent with no problem. It feels good on the skin and isn't greasy. COMMENTS: This is a very nice lotion. It does not leave your skin oily even when fragrance is added. It soaks into the skin very nicely, and quickly. A must have for lotion lovers. "It was good for a Basic"
COMMENTS: This is a good base for a basic lotion. I'm not in love with it however I live in a very dry climate. If I was going to continue using it I would add some olive oil and thicken it up a bit. Good base though easy to use. COMMENTS: This is a great starter base for those who are interested in getting into selling lotion! I started with this base and literally sold out! I will keep using this basic lotion in addition to my premium lotions as well! I would suggest getting this! COMMENTS: This stuff is great - it's light, yet does its job nicely. It doesn't feel greasy, and it doesn't have much of a scent on its own. Fragrance and colors incorporate nicely, and it sells well! COMMENTS: This lotion was so easy to work with. It accepts color and scent beautifully. It feels good on the skin and isn't greasy. I used santa red color (came out pink) and Love Spell fragrance. Got great feedback. Would use again with Georgia Peach scent and orange color. COMMENTS: Makes skin very soft and silky, holds scent very well, my customers love it. "Great base for pump bottle lotions"
COMMENTS: Love this base for use with lotions packaged with a pump. Perfect velocity and fragrance oils do not thin it out. Glides on without a greasy feeling and has a nice finish. Recommend this to anyone that does not want to make lotion from scratch. COMMENTS: Added blueberry fo to mine. It was awesome. Very silky. Not greasy. COMMENTS: BEYOND easy to use! COMMENTS: These are some of the safest jars I have ever used. I have ceramic tile floors and I can't say how many times I have drop them and nothing happened to them. love it. COMMENTS: I got this and didn't really have a clue what to do with it. I had fragrance and color I knew I wanted to incorporate into it. The directions tell exactly how much of your additives to use so was easy to do what I bought it for. I was really surprised at what a great lotion it turned out to be. I gave a couple of bottles to family and they loved it too!! Great product! COMMENTS: I love this base. Blends well with oils. COMMENTS: With this lotion base, I've made lemongrass/verbena lotion, lilac lotion, gardenia lotion, and a men's lotion. Very versatile, clean and fresh - I just love this base! COMMENTS: This lotion takes scent so well. COMMENTS: Love it feel great on the skin! COMMENTS: WSP recommends that no additional additives other than color or fragrance be added. Therefore, expect a very light-weight lotion. This isn't a thick cream that lingers. This is a good product for a basic lotion. COMMENTS: This lotion is a nice basic lotion. I heat the product up, incorporate color and fragrance and pour into my bottles. It is very easy to use and is nice lotion. My customers like it! COMMENTS: Purchased this as a lotion base for essential oils. It goes on smooth without a greasy feeling after. Very gentle and moisturizing. COMMENTS: This is a very light, non-greasy lotion base. My customers love it! "I like the product and the price is great! " COMMENTS: I received my order and immediately started testing each product on different parts of the back of my hands. I was a tad bit disappointed with the basic lotion base only because it seemed more runny than the other two lotion products that I had ordered. I know that each person or customer likes different consistency when it comes to lotion. So, it's probably just me that might not be exactly in love with the lotion base, my customers might have a completely different very. It did soak nicely into my skin and I'm actually curious to see how it will hold up with a FO or EO added to it along with the binding agent. The real critics will be my customers in the end. My job is to offer two wonderful lotions for them to choose from. I will certainly update after I sell my lotions and post what my customers like about the lotion. I really liked how this lotion, even though thin, soaked right into my skin and didn't make my skin greasy at all. The base has no smell at all and will be perfect for being creative with our FOs and EOs to add to each order. I am actually looking forward to creating small samples to share with family and friends to get their feed back. • It goes onto your skin easily. COMMENTS: Very easy to work with. It kept skin moisturized. COMMENTS: This lotion base is ABSOLUTELY FANTASTIC !!!! It takes scent and color very well. I use the unscented for my face as I didn't want any fragrance and color around my eyes. My first scented and colored lotion was Lilac. I now automatically make this as a companion to go with soap of the same scent. I also use this when making my solid perfume sticks. I highly recommend this lotion, and will be buying this from now on. WSP RAWKS !!!! COMMENTS: This is a great base lotion. It's light and very smooth. This base is very easy to use. I continuously buy this type. Mixes well with oils. Please dont change a thing. COMMENTS: If this product had a 10 star rating, I would rate it 10 star. I didn't know what I had been missing until I ordered this. This is by far the best lotion I have ever used! So delicate, non greasy, instantly absorbs! I will definitely be ordering more of this one. It's my #1 lotion from this point on. My customers are going to simply fall in love with my lotions made from this base. My sister really like this one too. I think she is going to be one of my best customers. COMMENTS: Blends very nicely with oils for a smoother, creamier lotion. COMMENTS: Made hand lotion for my Mother & daughter's for Christmas with my 3 year old Granddaughter. This is the BEST lotion we have ever used on our arms & hands! It is light, not greasy and smells wonderful right out of the jug. Our skin all feels so very soft. AND my Mother, who is allergic to almost everything, is able to use this with no reactions to it. Thank you so VERY much WSP! COMMENTS: This is a very light lotion and minimally-moisturizing. Those with dry skin, living in winter climates, or washing hands often will find this isn't moisturizing at all. Even in the summer, I had to add additional ingredients so this was worth using, which defeats the point of using an inexpensive base. Spend the money for a better lotion-- your customers will thank you. COMMENTS: I love this lotion base. I wasn't sure if this would be something I would use or if I should go with a different base. But I am happy with this product as well as after adding fragrance oils to it. It heats up quickly and the FO's mix in very well. Im happy! COMMENTS: This is a great base lotion. It's light and silky smooth. COMMENTS: This is a great basic lotion that blends essential oils in the lotion. Many clients like this lotion. COMMENTS: I use this for my general body lotion and it is perfect. I make it in two sizes and have sold a bunch already and just started using this one. COMMENTS: I first bought a starter kit of this lotion base and then family members also like and wanted some of it! So I bought 5gal worth of it and love the smooth consistency of it. "Really Like This Base! " COMMENTS: I received this as part of a kit and I hate for any of it to go to waste! It absorbs nicely, holds scent well and makes my skin feel great! Will definitely reorder! COMMENTS: I just started working with lotions and I decided to start with this base. This base was real easy to work with while mixing fragrance oils in. I've let family and friends try this and they absolutely love it. It feels great, leaves the skin feeling soft and is not oily. "This is the perfect base for scented lotions"
"nice basic lotion, easy to work with"
COMMENTS: this is a great simple lotion base. you add your desired scent and color (if you like) and heat it up to pour into bottles. cake. COMMENTS: very conveniant pre -made base.This is for those that like a light lotion.It does not feel sticky. COMMENTS: I love the way this stuff feels, its very soft, doesn't leave a greasy after feel and is very easy to use! COMMENTS: This lotion is great "as is," with nothing added. I am adding it to my fragrance-free line of products. "Basic Blend equal many ways to finish"
COMMENTS: A basic blend that takes FO/EO and colorant very easily, not issue with texture changing of unpleasant finished product. COMMENTS: I just bought the basic lotion base. This is really nice. I was not expecting it to be like this at all. I think my customers will like it too. Very light and not at all greasy or sticky/tacky. I also like it unscented. Will buy again. COMMENTS: This lotion base is excellent. Nothing 'basic" about it! It is not watery, but a thick consistency and a little bit goes a long way. It holds scent very well. I love, love the fact that it leaves your skin so soft and does not have a greasy or oily residue. I am so glad I purchased this. Will be buying the five gallon next time. My customers love this lotion and so do I! COMMENTS: We use to buy some lotion base from another place and the stuff was awful. But then we started to buy from you guys and we love this base. We sell so much of our lotion and people just keep asking for more. We will keep buying this. COMMENTS: I love this product. I would absolutely recommend it to others, and there is no doubt that I'll be buying more when I run out. Shipping is fast as well as packaged safely and securely. This site has a great product for a great price. COMMENTS: This lotion takes color, oils, butters, fragrance evenly...love it! Smooth finish on skin not oily or greasy. "crafters choice basic lotion base"
COMMENTS: Nice and light. Oils blend so easily. "Did not expect this to be such a great product!" COMMENTS: When I first decided to try this base, I really wasn't sure what my expectations were, but for the price, I figured I didn't have much to lose. I was so pleasantly surprised by this product - the lotion itself is not greasy and soaks right into your skin. I'm also very pleased with how long the lotion holds a scent. I made a batch up for myself with my favorite fragrance, Rice Flower and Shea, and use it twice a day. My skin feels, looks and smells great! Awesome find! COMMENTS: I have not had an eczema outbreak since I started using this product a few weeks ago. I also gave a bottle of this lotion to my mother-in-law who loves it. She confirmed this lotion helped her to relax and helped with sore muscles and has been recommending this product to friends, family, and co-workers. "Very easy to use and wonderful on the skin"
COMMENTS: I look forward to working with this product. It takes scent very well and if slopped on the counter, one swipe and my hands are well hydrated. Customers like it and I like that I can use it for small batches to create samples. COMMENTS: I have been using this lotion base for a couple of months and I love the way it is not greasy or sticky. My customers love their lotion!!! COMMENTS: my customers (especially men) request this lotion on the regular. it's very lightweight and isnt watery nor greasy. EO and FO blends well. I'll definitely continue to purchase! COMMENTS: It's very good for a basic lotion. COMMENTS: I use this basic lotion for my donations for the seniors. They really like that it's so smooth. "Basic lotion Base is wonderful"
COMMENTS: This base is the easiest base I have used. I am only buying this one from now on. "good value for a good lotion"
COMMENTS: this lotion has a good skin feel and takes added oils and butters well. I have had an occasional 'failure' with the lotion falling apart after I tried to add too much fragrance or oils but that is my fault and fixable. It has a good skin slip and satisfied feel after a short drying time. I will continue to buy this base. If done carefully it can be 'stretched' and still present a good product. COMMENTS: This lotion base is easy to work with. It accepts color and fragrance nicely. The lotion absorbs into the skin without any greasy residues remaining.I would recomend using a pastry bag to fill the product into bottles. This lotion has been a great seller for me. COMMENTS: I used this lotion base and it left my skin soft and silky and blends well with different fragrances, it was really easy to use to make several different scented lotions. I would recommend for personal use and for retail if you like to make lotions to sell. COMMENTS: It is a good lotion base. It makes skin really soft.